Strategies determine exactly how your listings will be repriced on the marketplace. You can choose to create a custom strategy which gives you access to all the settings we offer or get started fast with one of our strategy templates or algorithmic strategies. We will never go below or above your min/max price set parameters. Below is an overview of our strategy types. Get the Buy Box (Algorithmic): An Amazon specific strategy that will compare your offer and seller metrics against the offer currently in the Buy Box and determine an initial price that will help you win it. Your price will be lowered incrementally in regular intervals until your offer wins the Buy Box. Sales Velocity (Algorithmic): This strategy allows you to view the 30 day sales velocity (units sold) for any listing in your catalog and set a target to either raise, lower, or maintain your sales velocity. 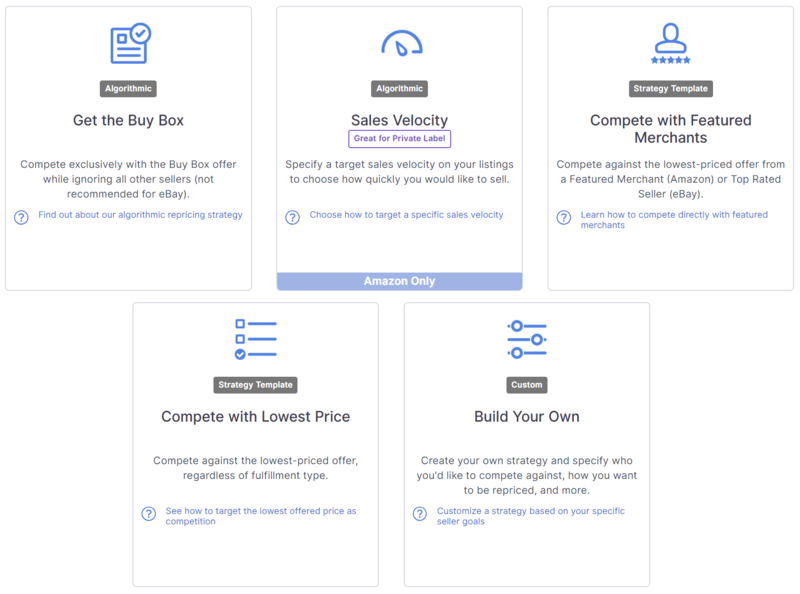 Compete with Featured Merchants (Strategy Template): This strategy is best for preventing you from competing with sellers who aren't Buy Box eligible. This is recommended when the Buy Box is suppressed. Compete with Lowest Price (Strategy Template): Informed will pull in the lowest priced offer on the page, and apply this offer as your direct competitor. Additionally, you can set your own pricing rules to dictate how you would like to be repriced against FBA/Seller Fulfilled Prime, MFN, and Amazon. Build Your Own (Custom): Start from scratch and build your own strategy. Define your competition based on a seller's Fulfillment Network (ie: FBA/Seller Fulfilled Prime, or MFN), Feedback Rating, Seller Rating Count, Featured Seller Status, or even compete directly against the Buy Box. You have the ability to duplicate or create multiple strategies, and you're able to assign any strategy to as many or as few of your listings as you'd like.